Fortified with another large breakfast, we were ready to put the previous day behind us, and press on with our schedule. The hotel owner gently suggested we probably were not going the best way about having an enjoyable holiday. But we were convinced otherwise. Disaster had neatly been averted and it was time to press on. In one important aspect this was the most significant day of the lot. We had to cut our planned route in half and so learned the most important lesson of the walk. You can route-march up to 20 miles a day but you will see nothing on the way and you will be constantly battling the clock. You are proving nothing to anyone by doing it. Far better to do 10, have a chance to look at the scenery as it goes past, stop at places that are interesting and enjoy yourself. This ought to be inscribed in letters of stone over the bookshelf which holds the maps and guide books for all future planning of walks. The morning was a treat, and started with a little bit of mild cheating, a ride on the funicular railway, up to Lynton at the top of the hill. The rucksacks proved a bit of a poser as even first thing it was packed with sightseers. But, after our experiences the previous evening when it seemed we had done ourselves too much damage to continue, this seemed like the height of ease and comfort. At the top we set off through the Valley of the Rocks along what the National Trail Guide describes as “the Victorian idea of a coastal footpath”. It is, of course, three feet wide and neatly tarmac-covered. In the town we had stopped at a bakery and stocked up on lunch and we were feeling self-satisfied about that too. The first small hitch came at the top of the funicular railway when a sheep tick, potential bearer of a horrible illness called Lyme’s Disease, was found on Lisa’s ear-lobe. With totally uncharacteristic insouciance she made light of it – after all it could not have been there all that long, could it? The tick was detached and we walked through the Valley of the Rocks, down the road which runs through the bottom, and on towards the first Lee Bay of the walk. There is a Christian community here and a hotel which appears to be a retreat. The sky got slowly darker as we passed before following a steeply-climbing toll road into woods. As we came off the road just after the Lee Abbey Hotel, joined a footpath and sat on a bench for a few moments’ breather, a second tick was discovered on Lisa’s upper arm. Odd, we thought, to never see a single one, then encounter two in one day. Still, the tick was detached, and had obviously been found quickly. We made excellent progress in the next few miles passing Woody Bay and pressing on towards Martinhoe and the Beacon Roman fortlet. We were especially pleased about this as we had made such bad time on the day before. There is a circular walk using part of the old coaching road which uses the coastpath in this area and we envisaged a coach and four tearing along the narrow track in bad weather as we walked along. Then it was time to lose the height we had gained around Lee Bay and drop down into the deep valley of Heddon’s Mouth. This isolated spot is, unlikely though it may sound, on the tourist trail because it is the home of a National Trust gift shop and that large, echoing and peculiar establishment The Hunter’s Inn, a very splendid coaching inn with a flock of tame peacocks bang in the middle of nowhere. We climbed down the steep hill and into the narrow valley before stopping for lunch by the stream at the bottom. We spread out a groundsheet, took off our boots and stuck our sore feet in the water before eating and it was great. But it was, realistically, the beginning of the end because soon afterwards we realised we couldn’t possibly stick to our ambitious plan of walking to Tintagel in a fortnight. First heavy rain came down with a vengeance and cost us an hour sheltering under trees. Then we scrambled up a killer hillside to walk around the terrifying section of path leading to Peter Rock. The path is horribly narrow and has a knee-high wall on one side. There are hideously steep scree slopes above and below. 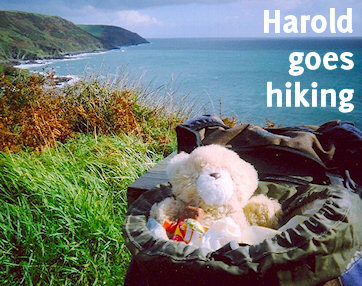 After the terrific climb up Heddon’s Mouth Cleave it became evident Lisa, who has no head for heights at the best of times, could not make it round the exposed track at all, let alone wearing a frame rucksack in a sharp wind. So we had to go back down into the valley, abandoning our plans to walk to Combe Martin, and wondering where we would be spending the night. We decided to start our search at Hunter’s Inn. Not necessarily the best accommodation for walkers as it apparently boasts four-poster beds. But the landlord, who didn’t seem to have changed much since Mark Wallington walked this way, recommended a farm just up the hill where bed and breakfast might be got. Andy telephoned ahead and Mrs Dallyn said she would be delighted to put us up. The hill, which goes in the direction of Martinhoe, put us in mind of Porlock Hill for sheer bloody steepness and we went up and down it several times before we were through with it the next morning. But we found the farm, introduced ourselves, flung off our rucksacks and made ourselves at home in a cosy double room before contemplating the very welcome prospect of a bath. We were invited to pop downstairs for a cup of tea later on. Lisa got in the bath first and there was a sudden yell as she found another four, or possibly five, sheep ticks. They had presumably bitten after crawling through a tear in her jeans. Andy was enlisted to twist them all off and no harm was done but suffice it to say no walking has been done since on Exmoor or Dartmoor without insect repellent sprayed liberally on the ankles. Andy, by contrast, has never been bitten by a tick before or since. We went downstairs for our tea and to watch the telly. Mrs Dallyn said tick bites, if infected, would swell up by the next morning and produce flu-like symptoms so they were all examined at two-hour intervals through the night. But nothing went wrong with any of them. The next day we had to remake our plans. The act of wandering off schedule had sapped our will to continue for the full two weeks and we were, frankly, sick of walking. So we decided to continue as far as Combe Martin. This meant we would have made it across Exmoor so, while failure to live up to our plans was a little bitter, at least we would have achieved something. Also exotic things like buses which could get us back to Barnstaple and therefore Exeter, so civilised it has pizza restaurants, were rumoured to stop there.